Announcement Cherished Cabin Quilts, designs and creates quality one-of-a-kind, handmade quilts and quilted items. In my shop you handmade items, sewn with love and attention to detail, that are ready to ship. Always feel free to request a custom order just for you or someone special! Please consider adding me to your list of favorites or just follow me! Cherished Cabin Quilts, designs and creates quality one-of-a-kind, handmade quilts and quilted items. In my shop you handmade items, sewn with love and attention to detail, that are ready to ship. Always feel free to request a custom order just for you or someone special! Please consider adding me to your list of favorites or just follow me! Custom order lap quilt blue and white with embroidered bible verses. Custom order yours today. Custom order for a lady who loves lilacs. What do you love? Request a custom order today with your life loves! Just provide me with a photo and I can create the picture... Just like this one! Finished and delivered! This wonderful collage of memories will be treasured for many years to come! Lovely patchwork strip pattern with three hearts in two diagonal corners. Hello and welcome to Cherished Cabin Quilts! Some time ago, I made the decision to switch careers and specialize in FUN-employment. Since then, I have never looked back! I love my life. I now work from home and am able to choose my own hours and be available to participate in my family's life, all while doing what I LOVE and creating one of a kind quilts. My hands are never idle, if I am not cutting fabric for a quilt, sewing at my machine or embroidering something, I am hand-sewing binding to the back of an almost finished quilt. I love fabric of all kinds and quilting completes my world. I am very critical of my work, so rest assured you will find a quality item at Cherished Cabin Quilts. I have been quilting with my Grandmother since I was a child. Most of my quilts are my own designs, the rest are all traditional patterns. I am happy to customize any of my designs for you, just send me a message. Welcome, and thanks for popping in! I live in a handmade world and there is nothing that says I love you more than handmade! Take a look around my shop and enjoy! Just maybe you will find that one of a kind treasure for you or someone special. I have been quilting since childhood and just can't quit! I love the fabric, colors and the unending design options. I can hardly wait to finish that next project. My idle time is spent in my work shop at the sewing machine. Please feel free to contact me anytime using conversation. Payment accepted by PayPal, Etsy Gift Cards, and Direct Checkout. PayPal is easy and secure. As anyone with a fetish for fabric knows, we acquire our fabric from everywhere! 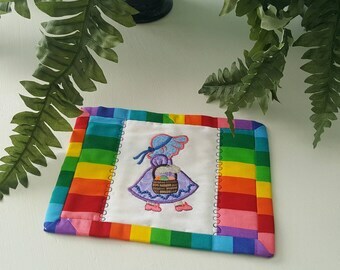 I am a patchwork quilter so I cherish even the smallest piece of fabric. I do not advertise smoke or pet free, because I do not always know it's conditions prior to purchasing it. I do pre wash anything that did not come from the manufacturer. I also wash each item prior to listing the finished project, as it helps pucker the quilting. My workshop is smoke free and pet friendly.